Beverages Abroad: Another huge update. Great stuff this time! Another huge update. Great stuff this time! Hello again dear readers. And thank you for dealing with my irregular posts. I have some great beers for you this time. I'm really happy to share them with you. First off though, some of the beers I did not enjoy. I will share them, as I have all the previous beers. I Don't want to be bias against the larger beer companies. They too make good beer sometimes. First off, we have a "new" drink from Asahi. The Direct Shot. Basically it is a standard light Asahi taste with a larger mouth opening... The main draw for me is that it was 105 yen a can. Next is Sapporo Black label. It was decent not too pricey, and a mass produced darker beer. Something akin to Guinness with less flavor. The last of the trio here is Sapporo Ice label. Not awful, drinkable, but hardly any flavor, it was a generic "ice" beer. I would compare it to Icehouse in the states. Not great. Ok, enough with the bad in with the good. First off I would like to draw attention to Bass pale ale from England and Lowenbrau from Germany. Both of which were good. Better then the mass produced Japanese beers anyway. Though both are mass produced European drinks. At any rate I just wanted to mention their appearance in a local beer shop. I really enjoyed Bass pale ale. I'm expecting to have more of these in the future. Good full flavor, nice color. A win in my book. Now for the winners. I have quite a few. To be honest it would be VERY difficult to pick just one. While I was in Tokyo last week I met a man named Tim at a bar called Devil Craft An amazing bar in Tokyo which sported a variety of American micro brews from Washington. Diamond Knot has some great stuff, I sampled their Brown Ale and the IPA. Both of which were amazing. IPAs are some of my favorites. I really enjoyed theirs. Not too overly hoppy. Nice backbone (As described by Tim). As for the Brown. Great smooth taste. Really flavorful dark brown color. Another great beer. The only thing that put me off were the prices. 1100 yen for a pint. A little much, but 1800 yen for great pizza more then justified my spending 2200 yen on good beer. Overall a great night! Tim suggested a microbrew from Japan called Baird Beer. It seems like an awesome brewery, I found a few of their drinks in a small drink shop near Tokyo Station, reasonably priced too I might add around 450 yen. I grabbed the Teikoku IPA and Angry Boy Brown Ale. The IPA was amazing. Nice full hop taste, with great color and some bite. The Brown Ale I did not like quite as much, it was still pretty good, with a bit more bite then I expected, but nice full flavor still. I plan on trying more of their stuff in the future. I was really impressed with the quality. I would love to try Baird Beer on tap. Next I will bring up a local brewery for me. The Aqulia Brewery has several really good beverages all brewed locally in Akita. The bar sports a Nomihodai (all you can drink in X hours) which is 2100 yen. A great deal if you plan on drinking 4 or more beers. They come in a huge glass. And the owner of the place. A very eccentric man, from what I can tell, but full of personality, actually knows how to pour a proper beer! 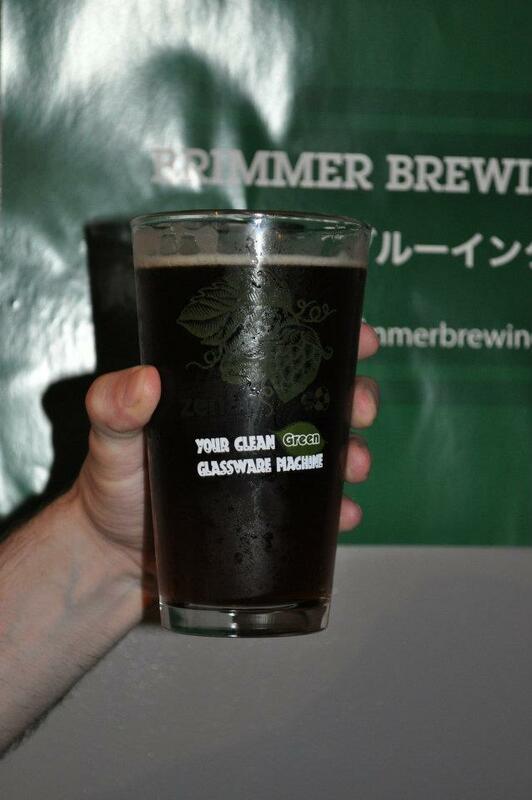 Apparently it is the standard to have 3 inches of nasty head on every beer poured in Japan. I still have not figured out why. At any rate, thanks for reading everyone. Sorry again for the long delay between updates. Cheers! Good post, Kelly. I wish I could try some of these with you. You might need to bring back a couple of your faves when u come home.